Despite growing momentum to promote early childhood development around the world, many countries continue to struggle with providing quality education, health, and social protection services for all young children and their families (UNESCO, 2017; UNICEF, 2017). Improving the quality of early childhood experiences depends on strengthening the skills, professional development, and employment conditions of those who work with young children. Yet often early childhood workers are undervalued, underpaid, and inadequately prepared (Urban et al., 2011; International Labour Organization (ILO), 2012; Neuman et al., 2015). This raises a number of questions about how to effectively support early childhood workers: what do early childhood professionals and paraprofessionals need to know and be able to do in order to succeed in their roles? What motivates members of the early childhood workforce in their day-to-day work? What policies are needed to support a qualified, stable workforce at scale? To address these questions, the Early Childhood Workforce Initiative (ECWI) recently carried out three in-depth country studies of the early childhood workforce in Peru, South Africa, and Ukraine. ECWI is a global, multi- stakeholder effort co-chaired by R4D and the International Step by Step Associaton (ISSA) to promote high-quality, equitable services through a focus on those who work with families and young children, as well as those who supervise and mentor practitioners. ECWI supports rigorous analytical work, the development of new tools and resources, robust communication efforts to share best practices through an online knowledge hub and webinars, and learning activities among policymakers, practitioners and scholars, with an emphasis on both South–South and North–South exchange. The studies shed light on the challenges affecting the quality and supply of the early childhood workforce and identify recommendations to overcome these bottlenecks in each country. Each country study focused on specific members of the early childhood workforce who support young children and their families. 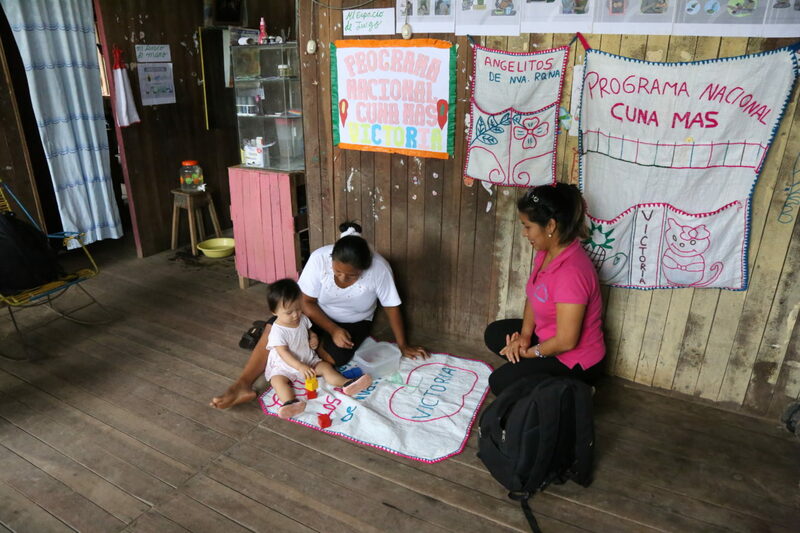 We studied the Cuna Más home visiting programme in Peru (Josephson et al., 2017), the First 1000 Days health services in South Africa (Hatipoglu, 2018), and preschool programmes in Ukraine (Putcha et al., 2018). In each country, the research teams carried out key informant interviews and focus groups with a mix of early childhood practitioners, parents, local and national policymakers, and representatives of training and professional organisations, and then analysed these data using qualitative methods. Where feasible, cost data were incorporated into the analysis. Together, these three studies offer a set of cross-country lessons to inform efforts to improve policies for the early childhood workforce in diverse contexts. The roles and responsibilities of the early childhood workers in each country we studied are quite different – as are the settings in which they work. They vary in terms of the target age group served, whether they work in homes, centres or schools, the degree of formality of their role, and the types of services delivered. For example, in Peru home visitors in the Cuna Más programme are locally recruited volunteers who travel to homes in rural areas facilitating non-formal, developmental activities with children under age 3, whereas kindergarten teachers in Ukraine are highly trained professionals working within an established, publicly funded national early education system. In South Africa, the roles of community health workers (CHWs) are evolving with the goal of implementing the First 1000 Days services by integrating parenting and early stimulation messages into their existing maternal and child health tasks. As frontline early childhood workers take on important new responsibilities to promote child development, they need new forms of support and guidance. In all three countries, the roles of those who work with young children are expanding and their responsibilities are becoming more complex. In South Africa, for example, CHWs are required to know about and cover topics ranging from prenatal and newborn care to the management of chronic diseases. As part of the emphasis on the first 1000 days, the recently introduced National Integrated Early Childhood Development Policy calls for the integration of early stimulation messages and activities into home and community visits with families (Republic of South Africa, 2015). Questions have emerged about how best to ensure that CHWs have the skills and support to effectively carry out these additional tasks, including how to expand their focus from providing health and growth monitoring services to include ‘nurturing care’. In Ukraine, a recent policy shift toward the inclusion of children with special education needs within mainstream kindergartens has been challenging for teachers to do well without relevant in-service training or sufficient numbers of teaching assistants. In both Peru and Ukraine, early childhood workers identified engaging and communicating with parents as an area where they needed more training and guidance to carry out their work effectively. "‘ECWI promotes high-quality, equitable services through a focus on those who work with families and young children, as well as those who supervise and mentor practitioners.’"
Improving access to and relevance of training for frontline early childhood workers is inadequate without attention to their supervisors and mentors. Frontline workers learn best when training is practical, hands-on, and reinforced on a regular basis (Mitter and Putcha, 2018). In Ukraine, where preschool teachers have regular access to in-service training every five years, we learned that while these sessions are often lecture-based, teachers are much more interested in opportunities to learn from their peers. In South Africa, where CHWs have varied levels of formal education, training material needs to be more practical and less theoretical. In addition to better access to relevant training, to be effective early childhood practitioners, frontline workers benefit from regular, effective support from supervisors and mentors in the field. Ongoing support, including supportive supervision, coaching, and mentoring, is particularly important for paraprofessionals, who may have limited education and initial preparation (Mitter and Putcha, 2018). Yet, it is common for supervisors and managers to focus more on compliance than on supporting and coaching frontline workers. In Ukraine, methodologists – experienced teachers who provide regular classroom guidance and support to more novice teachers – are well positioned to provide pedagogical guidance on a range of topics, including working with children with special needs, but they too need access to updated information and training. As one teacher trainer noted, ‘In a year, even in half a year, everything seen or heard by the preschool teacher in the room becomes already old-fashioned. It’s like a cell phone.’ Peru offers a potential model. Home visitors in our study expressed their appreciation for the rich content and engaging delivery of training sessions, as well as the focus on continuous support and supervision they received from regional staff. Regional supervisors accompany home visitors on two visits each month to observe their work, discuss any challenges, and provide feedback and guidance. Although early childhood workers expressed strong intrinsic motivation to do their jobs, they face challenging day-to-day working conditions. Early childhood workers view themselves as positive change agents and see value and direct impact from their work in fostering the health and development of young children and families. While workers are motivated by factors other than compensation, care must be taken not to exploit this motivation. Across all three countries, low pay, heavy workloads (for example, large caseloads for community workers in Peru and South Africa and large class sizes in Ukraine), and challenging working conditions (such as short contracts, extensive travel, safety concerns, non-traditional working hours) affect workers’ morale and their ability to carry out their responsibilities effectively. Community workers in Peru and South Africa cited additional day-to-day challenges, such as insufficient and/or inadequate materials (for example uniforms, kits) and resources (inadequate cell phone and transportation allowances), whereas kindergarten teachers in Ukraine expressed concerns about the burden of excessive paperwork. In Peru, home visitors struggle to balance their Cuna Más role, for which they receive only a small stipend, with the need to earn other income and meet their family responsibilities; several respondents cited increasing turnover rates as a result. As one home visitor asserted, ‘The stipend is very little … the ten hours they tell you … we don’t work ten. If they added a little more [to our stipend], we wouldn’t look for other options.’ Depending on the challenge, differing levels of financial investment are needed (for example, wage increases tend to be more costly than investment in new materials). However, improving day-to-day working conditions as well as addressing remuneration and status of the profession would probably boost staff morale and improve the quality of early childhood development programmes (OECD, 2012; Eurofound, 2015). "‘Frontline workers learn best when training is practical, hands-on, and reinforced on a regular basis.’"
Limited career pathways constrain recruitment and continuous quality improvement of the workforce. Across the three countries, additional training and experience are not clearly linked with remuneration increases or opportunities for career advancement. Along with low pay and status, limited career pathways have led to problems in recruiting and retaining qualified workers. In Ukraine, for example, it is difficult to recruit qualified candidates to teach in preschool, particularly in urban areas where there are more attractive, better-paid employment alternatives. A substantial number of trained preschool teachers choose not to enter the field at all after graduating. Despite the existence of pathways for teachers and support staff to advance within the preschool education system, in practice there are few opportunities for career progression. Although some home visitors in Peru expressed the view that they were growing both personally and professionally just by working with the programme, there are typically few incentives (such as opportunities to advance and become professional programme staff) for community workers to invest in improving their skills over time. Building career pathways that are linked to both financial and non-financial recognition is important for recruitment, retention, and continuous quality improvement of the workforce (Mitter and Putcha, 2018). "‘Early childhood workers view themselves as positive change agents and see value and direct impact from their work in fostering the health and development of young children and families.’"
As more and more countries seek to expand and improve early childhood services, the essential role of the workforce can no longer be overlooked. These four workforce issues may seem daunting to address, especially given that policymakers are often working within constrained budget envelopes. While each of these areas is important for ensuring a strong and supported workforce, individual countries will need to make difficult decisions in determining which ones to prioritise. Fortunately, additional investments in training, better compensation, and ongoing support are expected to create some efficiencies by reducing turnover and the loss of trained workers who leave (or never enter) the field. At the same time, well-compensated and motivated workers are more likely to foster stable, positive relationships with young children that are critical to promoting healthy early development and learning.